Seriously injured as a result of someone else's neglegence? 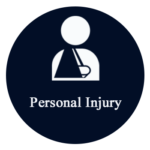 ​Have you suffered physical injury due to an auto accident or a slip and fall? Have you been injured due to neglectful conditions on commercial space? Seeking help to navigate your claim will not only ensure that you are making the right decision, but will lead to a substantially larger settlement when dealing with the insurance company. We will walk you through the claims process step-by-step, ensuring that you are informed on every decision. Be sure to know your rights and potential remedies, before negotiating and speaking with the insurance company.